OR : ANY OF THE RECOMMENDED STEIN DEALERS / AUCTIONEERS AS LISTED ON MY “LINKS” PAGE. I just do not have the time TO APPRAISE! a bunch of steins there are way too many variables► condition, location, time of year, present trends in stein/ drinking vessel collecting, local (and now national) economics; but by far the “biggest problem of all ….in communicating “so called values” are the prior expectations by the owner[s]! (which are usually based on hearsay and old, old rumors provide by other family members!! Okay, I’ll start at the beginning. The Renaissance of the 15th and 16th centuries brought new light out of the Middle or Dark Ages. Money, art, science, literature, religious movements, travel, and trade unions and guilds, among other things, flourished and shaped the rebirth. For the first time, there were middle and upper classes based on earned wealth and affluence. This growing wealth was amassed by both traditional royalty and by a new merchant class who made fortunes by exploring, inventing, designing, producing, manufacturing, and trading. For the first time since the fall of the Roman Empire more than a thousand years earlier, exploration and exploitation brought huge sums of money, raw materials, and finished goods into the coffers of Europe. Whether they were porcelain and silk from the Orient, food and raw materials from Africa, or gold and tobacco from the New World, fortunes were to be made in travel and trade. Figure 1. Ostrich egg pokal mounted in pewter; 19″ tall; Historicism period c. 1890; Germany. With this new affluence, the whole focus of life in Europe changed dramatically. New castles were not built just to survive war, but to provide a luxurious environment for their inhabitants. Art and music went from simple and austere to complex and majestic. Travel went from being a dangerous necessity to being an ennobling educational adventure. Architecture, painting, and sculpture combined the technical advances of new materials and methods with the new ideals of artistic, religious, and creative grandiosity. Bigger was better! More gold was better than less gold; large groups of musicians serenading you were better than the old flute and lyre; a hundred pieces of porcelain on your mantles were better than a half dozen wood or pewter candlesticks. To sum it up, conspicuous consumption was in — while piety, simplicity, and sacrifice were out. But the Renaissance was not just about wealth and accumulation. It was about education, learning, research, and exploration. It brought a rebirth of European thought and culture. The cradle of the rebirth was Italy, which was founded on the educational and spiritual heritage of ancient Greece and Rome. Italy may have been the cradle, but that cradle was rocked by the Germans, the Dutch, the Spanish, the Portuguese, and even the English. Exploration for the sake of exploration, knowledge for the sake of knowledge, science for the sake of science, and art for the sake of art became the standards everywhere. The affluent not only had to possess things, they had to know about their possessions. They participated with the architects in designing their residences. They became patrons of the arts. They developed libraries. They learned several languages. Universities were started; trade and manufacturing guilds established. Travel became a necessary part of a person’s education. Ostriches were seen for the first time in the wild in Africa. Can you imagine confronting an ostrich for the first time-never knowing that such an animal even existed? You would have to bring it, or at least an egg, back with you to prove your story or no one would believe you. The same was true for coconuts, unusual colored stones, unusual sea shells, ivory tusks, and other oddities. The nautilus shells from the Indian Ocean were miracles of nature with up to a hundred inner chambers — each in an exact mathematical logarithmic progression in size. They were highly prized. Figure 2. 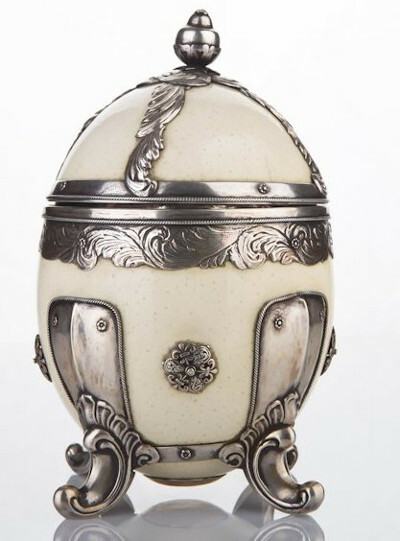 Left — Ostrich egg covered cup; sterling silver mounts show the hallmarks indicating the piece was made by James Scott; 11½” tall; c. 1812; Dublin, Ireland. 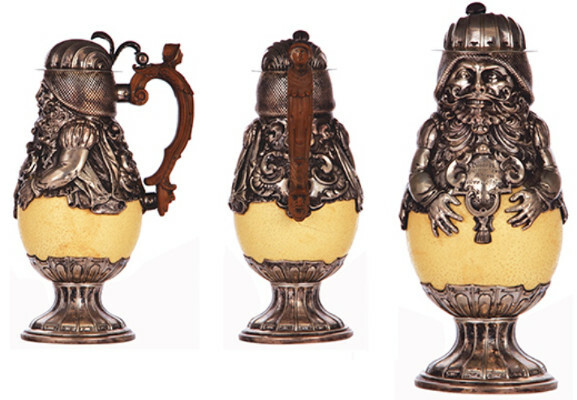 Right — Ostrich egg beer stein mounted in pewter; 10½” tall, by J. Lichtinger, Munich, Historicism period c. 1890; Germany. But this was the Renaissance! While some were content to use shadow boxes to display treasures acquired through travel, the real connoisseurs of art and science required that these be turned into something both beautiful and useful. 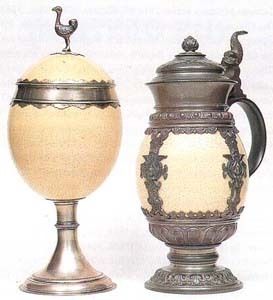 Hence, ostrich egg, coconut, and ivory drinking vessels were made in the form of steins, cups, and pokals. These were often mounted in silver or gold and even embellished with pearls and jewels. Ostrich egg cups embodied the Renaissance. Exotic materials — mounted in precious metals that required excellent craftsmanship to develop them into functional art forms — said it all: “I have traveled. I have knowledge. I have affluence. I know craftsmanship. I want to be surrounded by beauty. I am someone special. I am a Renaissance man!” This is the first historic context, one that demands that an illogical item like an ostrich egg be used to drink beer or wine. The second historical context? Well, as I said, this ostrich egg stein was made about 1890. The second half of the 19th Century was called the age of Historicism or Retrospective Art. There was an intense, growing interest in history and an appreciation of Germany’s long influence on Europe. The completion of the great Cologne Cathedral forged a strong emotional bond among Germans and showed an artistic link to the past. Characteristics of past styles from the Renaissance and Baroque periods were taken up again. The resurgence of nationalism in Germany and the unification and expanding wealth created by a newly technological and highly productive society mirrored the growth and development of the first Renaissance. This wealth provided the financial fuel to duplicate the best of the past. As art historian Gottfried Semper put it, “The goal was to apply the designs, styles, and principles of the past to serve modern needs.” Workshops employing the most talented craftsmen flourished. The famous workshops of Fritz Heckert in Petersdorf and Egermann in Haida were world-renowned for making glass in the Old German Renaissance style. Stoneware manufacturers in Höhr-Grenzhausen, Saxony, and Bavaria produced copies of 16th and 17th Century Siegberg, Cologne, Raeren, Annaberg, and Creussen steins and drinking vessels. Ostrich egg, coconut, nautilus shell, agate, and ivory drinking vessels were copied during this romantic and extravagant Historicism period. The most wealthy may have had collections of original Renaissance masterpieces, but even the middle class could show off superb copies of their links to the past. They said, “We represent the new Renaissance, the birth of a strong new country — Germany.” But unlike the mathematical truth of the 1600s, this new whole Germany will be much greater than the sum of its parts. This is our historical context. Additional relevant photos provided by the editor. Editor: This piece above is of interest in that a wooden handle usually indicate a type of vessel that can hold a hot liquid such as tea or coffee. As both would stain or perhaps crack an egg such as this, the exact reason for using wood has not been forthcoming. By the time I was wise enough to watch my step; I was too old to go anywhere! !